SOME call this a "FIX KIT"
NOTE: RKT Top end gasket kit is comprised of the Base Gasket, Y -Pipe Gasket, Exhaust Valve gaskets, and Inner Compression O-rings. NOTE: This will address the issues associated with the OEM pistons! This is the LEAST EXPENSIVE and BEST option for addressing this issue!! Below is a little information regarding the issues with the OEM Piston. With this 800 CFI engine (Pro or AXYS), the lower half of the engine is dry.. meaning there is little to no fuel entering there. FUEL (NOT COOLANT) is the #1 cooling agent for ANY Engine (important to remember) and this engine has none! Heat is one of the primary causes of skirt collapse and skirt collapse is ONE of the primary issues with the OEM design.. Remember this, VERY IMPORTANT, a compression check will tell you little to nothing about the health of your skirts. You can have a BROKEN off lower skirt and the compression reading will not change! So, doing a compression check will not yield any relevant information regarding the health of your PISTON SKIRTS. People always state "I pulled my OEM pistons and they LOOKED fine and compression reading was still in spec! LOOKING fine and MEASURING fine are 2 VERY different things..
You MUST MEASURE the piston in order to determine if the piston is "GOOD". Skirt collapse happens usually WITHOUT any scoring or visual appearances on the piston. In other words.. your piston can LOOK perfect but MEASURE out of spec. Our CUSTOM pistons (Direct replacement, Drop In, AND Big Bore) are CUSTOM designed! They have very a proprietary design that is unique to ALL of our pistons. They are also lighter than the OEM Piston and that will help with the acceleration from a stop. One other VERY important misconception... It is a widely held belief that the OEM pistons are too small from the factory and this is where the issues lie. The OEM Polaris piston is 100% in spec and the proper size when new in the box! The REAL issue is that the OEM piston does not REMAIN in spec after use. The poor manufacturing of this OEM piston and dry lower end design allow this piston to quickly get out of spec. So, when you hear that all these aftermarket kits have a tighter tolerance than the OEM.. it is simply NOT true! The truth is that the OEM piston's tolerances are in spec, they just don't stay there. Our custom piston HOLDS its tolerances.. Can't say that for many of the other kits.. Please do your research! Have no worries.. HELP is finally here for the 800 Polaris CFI Engine! Yes, these fit the new HO Engine. No "gimmicks" that claim to address the issues but really do nothing. Please be aware of "CLAIMS" that the OEM cylinders are over-sized from the factory!! This is simply a sales "gimmick". We have measured 100's of these cylinders and NONE of them have been out of spec! It would have required a HUGE final bore machining/boring error for this to happen... again, this is a clever gimmick to try and sale you something! There is NO problem with the sizing of the cylinders. There IS a problem with the pistons . Please see below to learn more about our solution! The RK Tek Line of Customs Pistons are VERY Unique... ALL pistons are designed from a blank sheet of paper and uses only the highest quality of components. We design the piston that should have been installed from the factory. We, usually, end up altering MANY of the OEM piston's design aspects and "correct" the short-comings we feel are present. The piston we use is VERY CUSTOM! We have been designing our own pistons since 2005. This piston WILL address the issues associated with the OEM Piston! The piston is custom designed with different ring location and oil feed holes and pin location. These are the BEST pistons you can buy!! 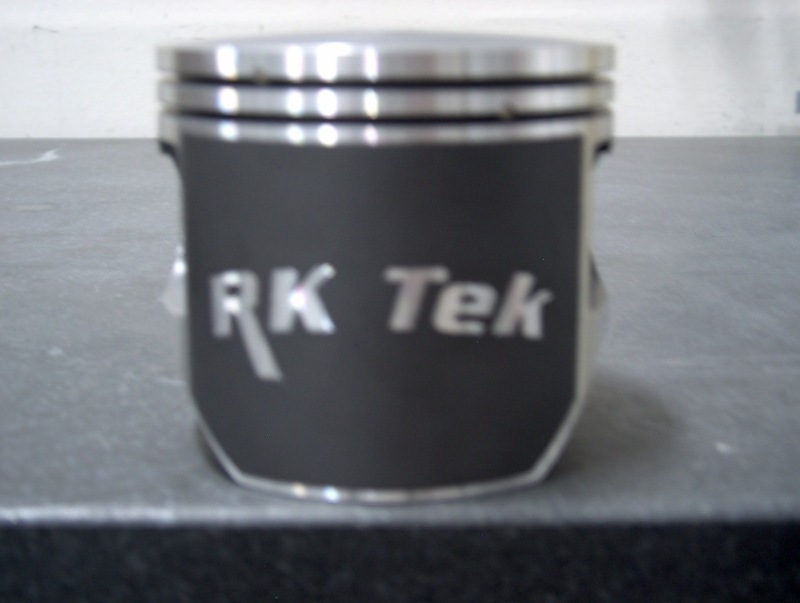 NOTE: The RK Tek Line of Pistons are VERY different from any other production piston. NOTE: This is VERY important...These pistons have a VERY unique design criteria. You do NOT have to treat these pistons any different (in any way, shape or form) than your stock piston! They require ZERO added "treatment"! They will NOT fail unless they are subjected to a low fuel or high heat condition! These pistons are the BEST piston available on the market today! BAR NONE! After some teardowns and inspection of MANY of the stock pistons. Our inspections show that the stock piston has several "short-comings" that can lead to failure. FINDINGS: We find that the OEM Polaris Piston will NOT hold its form after a very short time of running. We have found it common to see the piston to cylinder wall clearance DOUBLE in less than 1000 miles.. THIS is the #1 reason behind these cylinder failures associated with the Polaris Engine!! IT IS NOT due to a rod ratio error! It is SOLELY related to excessive piston to cylinder wall clearance! The RK Tek Pistons address this issue 100%! While there are some "What were they thinking" aspects of this engine.. in OUR opinion the rod ratio is not one of them.. While we can not address ALL the issues we see with this engine we can address a very big one in the piston design.. and that is what we have done with this offering. There is no RPM change with this kit. The kit simply addresses the issues associated with the stock (OEM) Piston. We also have found that the ,annoying, low RPM vibration (handle-bar "death shake") is gone with the install of these pistons. MUCH Smoother running at ALL RPM..
Piston side loading is reduced due to our unique piston's weight. Yes, this piston is much lighter than the OEM piston and having a lighter piston will reduce piston side load pressures AND reduce the stress on the crank! Less Stress = More longevity and more power! We, REALLY, do address the OEM piston design issues with this kit. No more "SLOPPY" OEM piston with poor piston geometry. BEST PART: NO AFTERMARKET PIPE, Fuel controller, OR anything else is needed! We, purposely, designed this kit to perform using the components! Once you have the kit installed.. YOU ARE DONE!! Reliability is NOT compromised in any way, shape, or form and the cost is VERY affordable.